It occured to me that runners need to have a special greeting when meeting at the start of races to avoid that uncomfortable moment where a warm and greasy hand meets another warm and greasy hand. Invariably about 5 seconds after you have used your digits to apply lubrication to low hanging moving parts about 6 people will want to shake hands with you. This was about the 6th race of the year and we are all so familiar that there is no shame in it anymore. But in needs to stop and be replaced by something more hygenic. Any suggestions on how to get round this problem then let me know. "Run all the way with you??? HA HA HA HA HA"
2nd week in a row I was doing a new race, the Thames Trot. One that I decided not to do 2 years ago purely because I thought the name was too silly but I have since got over that. There were the usual suspects present, Mark, Rob, Smelly, Trin. A couple of guys I had not seen in a while were there too, Matt Mahoney who I met in the MDS and who is doing Spartathlon this year and Neil Bryant who I met in the Spartathlon and is doing the Spartathlon this year. Nicole Brown was there too, not seen her for ages but can usually still hear her. The forecast promised an unspecified chance of probable rain. It looked quite grey to start with and was quite mild. I decided to only take a bottle belt with me this time as my arms were aching form being slashed by bags recently. My chatting with Neil and ROb lasted about as long as it took to realise that I could not talk and breathe while running at their pace. They ran on through the muddy fields of the ruver path. I have not been this far up the river before (that's not a metaphor). I have ran a couple of times into London from Reading but have not been as far as Oxford. It seems the further you go out the muddier the path is. It was hard work again plodding through the soff ground but at least it wasn't like last week. What is harder to run on? Molehills or Mountains? I ran with Mark till just after the first CP where he seemed to slow. He had just run 201k in a 24 hour track race last week so I could understand why he might be a bit slower than normal. I pushed on through the mud. Along the way I bumped into more people I knew by face but not name and we all did our Troy Maclure impressions as usual. "Hi I'm James Adams, you may remember me from such Ultra Marathons as the Ultra Race 90 and the washed out diet UTMB". I ran a little with a chap called Cliff who was much faster than I was and seemed to want to drag me up hills. 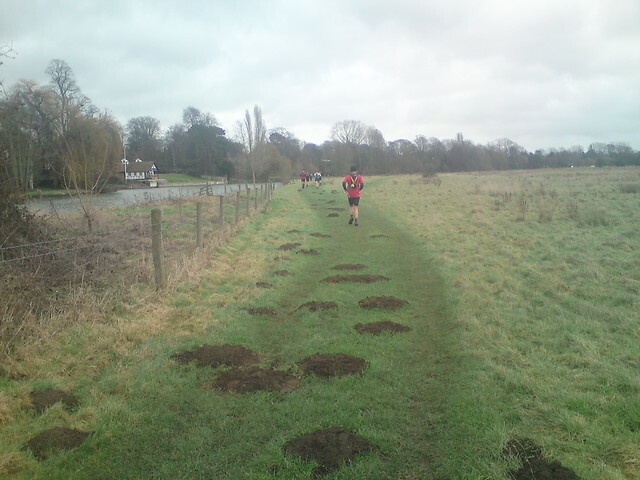 Yes there were hills on the Thames Path. I did the Thames Trot instead of the Pilgrims Challenge that I enjoyed so much last yeat just because I wanted to do different things. I can't complain that there is too much on now but it is quite difficult chosing between events now. I decided to help out at the second day of the Pilgrims tomorrow though and it would be great to see Gemma who was running plus a lot of other friends. Around half way the river cuts through the Ridgeway path that I am a little familiar with from the Druids Challenge. On a flat section of river it's quite nice to be surrounded either side by some beautiful chalk hills and you could actually see the path by the river becoming chalky. I'm not much of a geologist but I thought that was pretty cool. 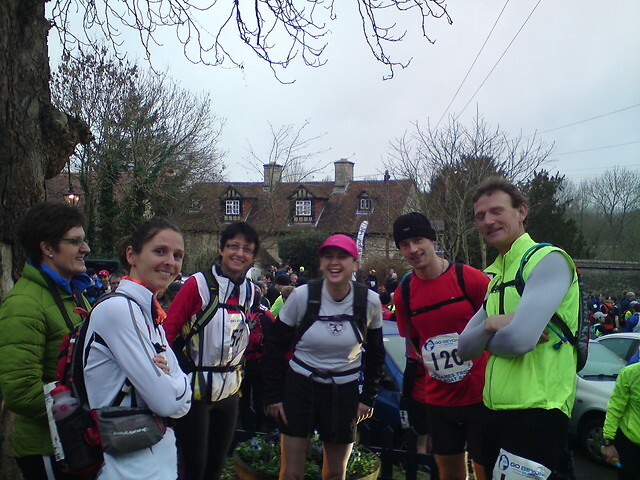 The third checkpoint was the checkpoint of my dreams, sausage rolls, pork pies, cake, crisps and drinks. I took a photo but forgot to eat all of it. Most of the others had sweets and drinks including energy powder which I filled up with at all 6 CP's. Later on I had to stop and stretch a couple of times but managed to keep up a shuffle and navigate my way to the finish. There was a bit of map reading towards the end as I was unsure whether I was running on river path or someones back garden, some of the people around here have far too much money. Who needs a railway in their back garden? With a station? The end came in around 8 hours, not bad for what felt fairly gentle. Neil and Rob had finished an hour before and Mark and Claire came in about 10 minutes later. Richard Taylor finished under 9 in his first race over a marathon and Matt Mahoney also blitzed it sub 7. I then went about my epic train journey to Merstham to get to the start of the Pilgrims Challenge that I was helping out on while trying to keep up with the Rocky Racoon 100 that had not long started in Texas. First update was that Ian Sharman had run the first 2 laps (40 miles) in 4.56 and was in first place by about 8 minutes in a field that included Scott Jurek, Anton Kuprica, Karl Meltzer and Zack Gingerich. Brave or stupid? The Pilgrims race was brilliant. I was helping on CP 1 and CP 2. It was quite windy and standing around for hours is actually quite hard work. It is great sometimes to be on the other side of running events. Overall it was a great weekend and a very eventful one for UK ultra-running. There will be plenty more of those to come, but I now have a drought of 3 weeks without an ultra marathon. Still, the 4 marathons I have later this week might help with that craving.